As an eco-friendly mom I like to find stores online that are strictly eco-friendly. I hate visiting a store and spending half my time searching for eco-friendly products or worrying whether the products I'm buying are truly eco-friendly. So, I'm glad I found EcoMom. 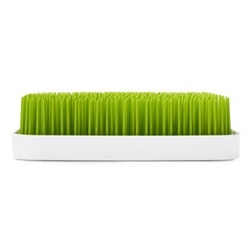 EcoMom, an eco-friendly online store, has given me the opportunity to review two of the many green products found at the store: the Boon Grass Drying Rack and a bottle of Smartypants Gummy Multivitamins. I really enjoyed testing out this Boon Grass Drying Rack. My baby is now a toddler but I was still able to place his toddler plates and sippy cups easily on the rack. I also have two school aged girls and a husband. So, I often found myself trying to pile on non-toddler dishes on to the rack as well. To my amazement the rack can hold a lot and in so many different ways. Just stick the dish between the blades of grass and this two-piece drying rack holds the dishes in so well. The dishes are practically dry a few minutes later. I like that I can reuse the water too. I just empty out the water at the bottom of the rack into a bowl and then dump the water into my garden. I'm also delighted to know that the dish rack plastic is BpA-free, Phthalate free, and PVC free. It also looks great and cleans easily. I only wish the dish rack was larger, large enough to hold 5 meal plates, 5 glasses, and utensils for five. In this larger version I would love to have a section of taller grass for the utensils and cooking spoons. 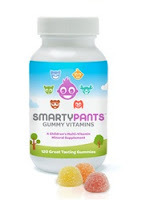 The Smartypants Gummy Multivitamins are tasty. They taste and look like gum drops. In fact, I had been adding 1 to each of my girls lunch boxes for the past couple of weeks and I just found out yesterday that they thought they were gum drops. The vitamins have eco-friendly non-tuna sourced DHA Omega 3's, are gluten and casein free, contain no high fructose corn syrup, and our naturally flavored from natural sources. Also every time a customers buys a bottle of SmartyPants, a donation is made to Vitamin Angels. I only wish they weren't so tasty. I was seriously tempted to snack on these vitamins. If I was tempted, than my kids would be tempted. I had to keep the vitamins high and hidden just to be safe. Still looking for holiday gifts? EcoMom has given me a promotional code for my readers. It will allow you to receive %15 of your first order. The code is SBBL711 and it is good up to December 31st, 2010. EcoMom's New Program: EcoPass. Purchase a $99 annual membership and you get %15 off every order as well as free shipping with no $50 minimum requirement. EcoPass pays for itself in just 4 orders. You can also follow EcoMomCeo on Twitter (twitter.com/EcoMomCeo), on Facebook at facebooks.com/ecomom, join the EcoMom newsletter. The giveaway is for residents of the US and Canada. EcoMom will send one winner a $20 gift. To win visit Eco-friendly Baby Products-EcoMom. Then leave me a comment letting me know what product you are interested in. You can get extra entries for following us through GFC or Subscribing via email. Make sure to let me know in the comments. Deadline: This giveaway will end on Dec 20, 2010. I will choose the winner using Random.org. US entries only. Please make sure your email is on your profile or leave it in your comment. If you win and I cannot contact you then the prize goes to the next person. Please respond within 48 hours. Disclosure: I received EcoMom products free for review from EcoMom. My opinions are my own. I'd love the terracycle wild bird feeder- I'm an avid bird watcher. I love so many products, it's hard to choose. I would love to try the Twist Euro cloth, dumpling cleaning pad, and loofa sponge. I like the Eco Cup on Ice! I'd like to try the Avocado Olive Ultra Smoothing Shampoo. I would like the try the organic shampoo/body wash and moisturizer for kids. P.S. I LOVE their gummy vitamins, too! cute and very useful..thanks for the giveaway.